That's the summary of what Ah Poong is. The name is a pun from the word apung which means float/floating in English, and it pretty much covers the definition. 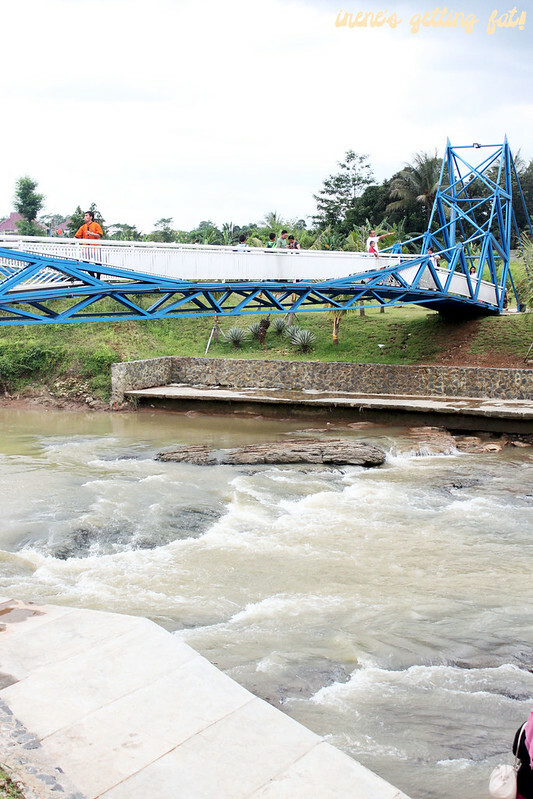 It's a food court, basically, located very beautifully over a streaming river in Sentul City, a part of Bogor, West Java. It's the sister of the well-known food court called Eat & Eat, collaborating with Bondan Winarno, one of Indonesia's famous culinary experts. I had always wanted to pay a visit, especially because I'm a fan of Mr Bondan, but also I was intrigued by the lovely photos of the place from the witnesses. Just a few days before my departure to Syd, Roo was feeling unusually very adventurous, so he drove straight to Bogor, and that was when the opportunity hit me. 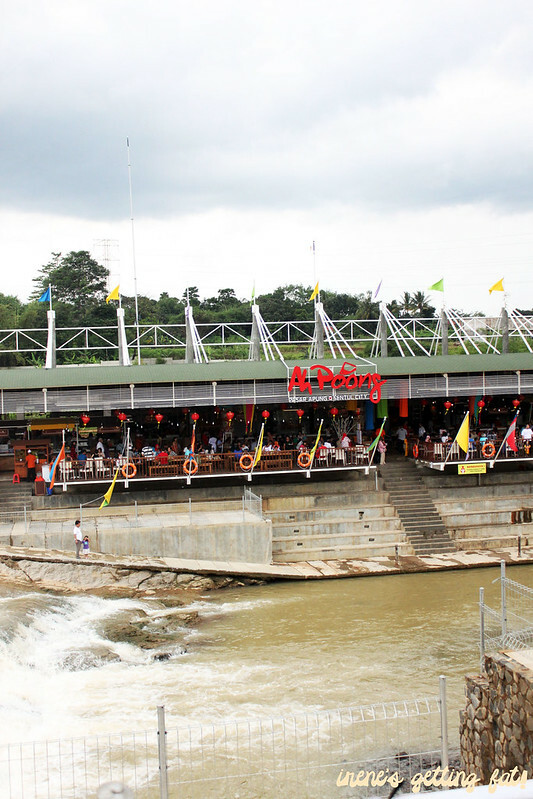 Ah Poong is really photo-taking worthy. It wasn't sunny when I was there, instead there was black clouds hanging around, which I love very much. If I am not mistaken, there are two bridges heading to the place. 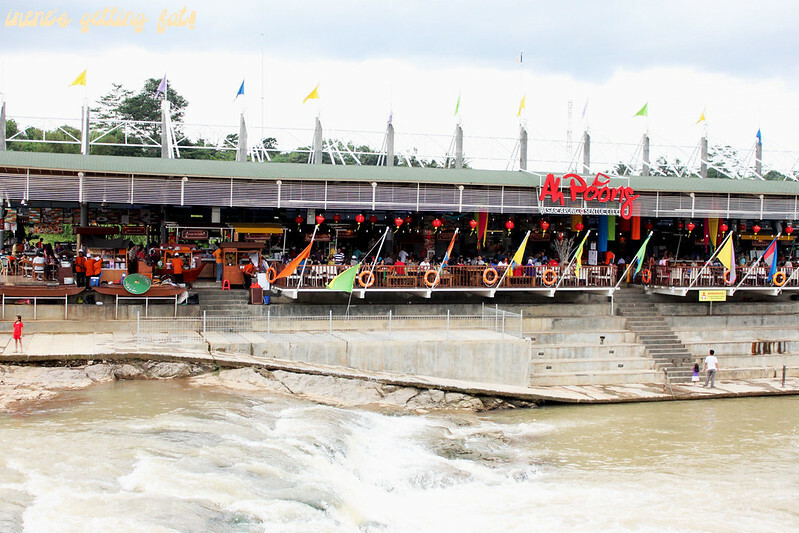 You can even go to the river side by a set of stairs, some visitors even dared to play around the rocks on the river. With a view so rare to find (in Jakarta), it's no question of why there were lots of people utilizing their cameras; from phone cameras to super huge DSLRs. The eating area is a long one, divided into two main parts. It's rather troublesome if you get a table on the front part and have to carry your food tray from the stalls at the second part all the way. Especially if you are as clumsy as I am. 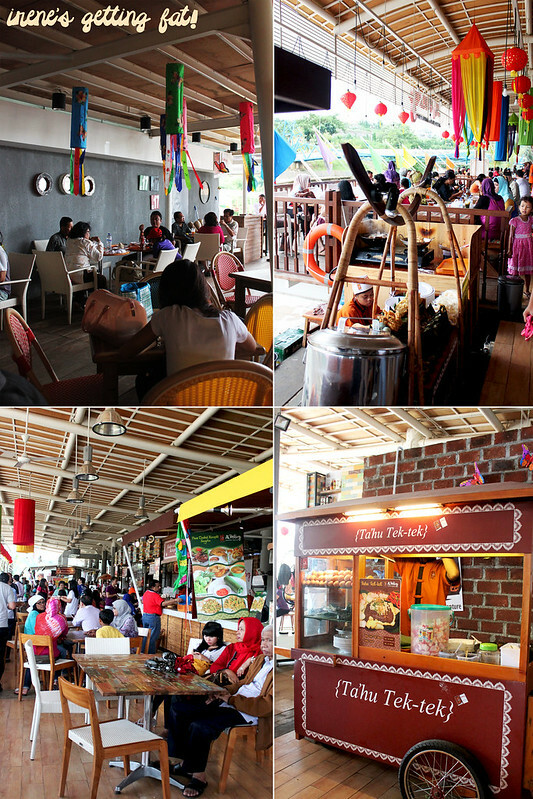 The place somehow feels traditional and modern at the same time, it has homey and playful vibe. Would be so much better if it wasn't that crowded. I had such a stressful time finding (or seizing) a table. And when I did get one, there was only one chair. Moral of the story: it's probably better to go either really early or really late. But it was weekend when I went, so it's probably better in weekdays? 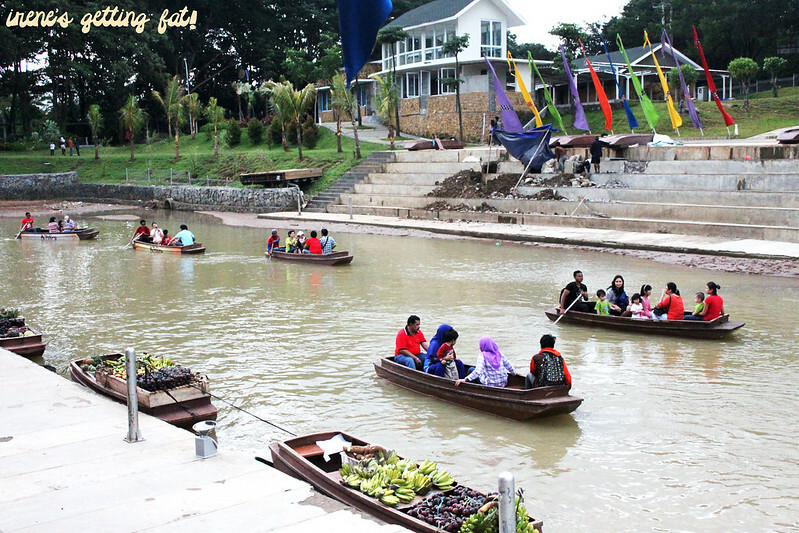 The floating market with boats selling fruits and veggies actually exist on the further part of the eating area, and you can even ride those small boats. Great facility for families, I reckon. You can't use your cash directly here. Load the paying-card with some amount of money at the cashier, and you're good to go. 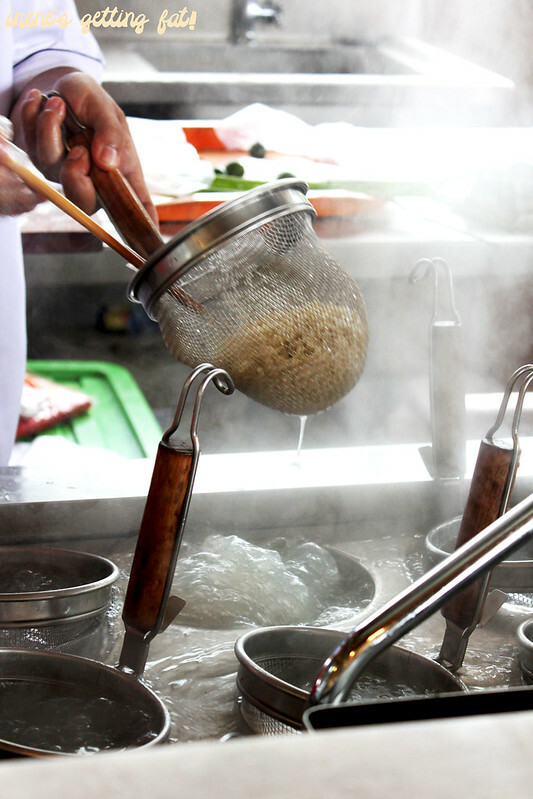 We started the day with a bowl of bakmi kepiting Kalimantan (Kalimantan-style crab noodles). There were heaps of selections, but because it was hard enough to explore all the stalls and the noodles-making process attracted me, we alighted to this one. 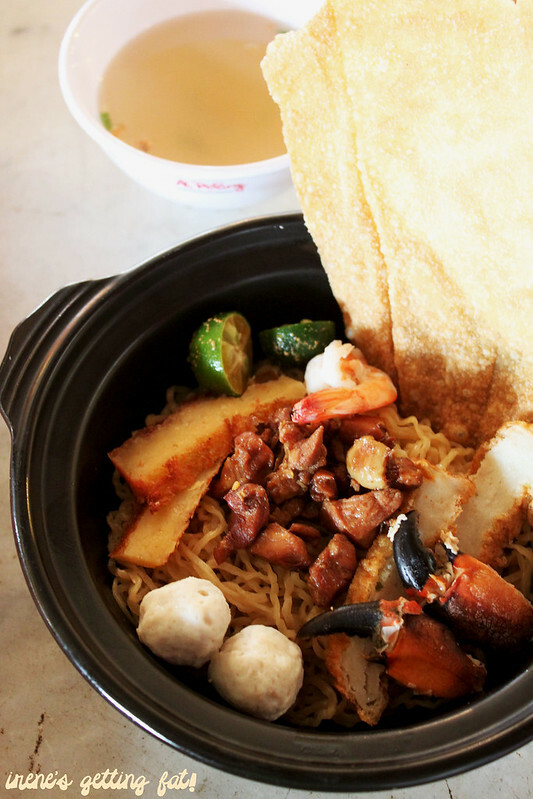 The bowl of crab noodles was rather crowded itself; thin, curly noodles topped with chicken cubes, fish cake, fish balls, two prawns, two crab claws, and a wafer thin fried wonton. 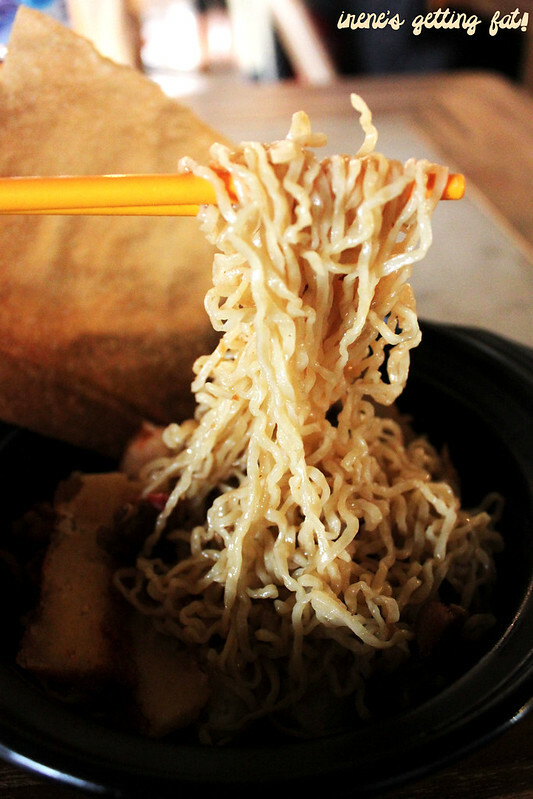 I'm satisfied with the noodles texture, it was thin but still preserved some firmness. It was seasoned well, and I have no complain about the toppings although I would love bigger crab claws. Roo decided to go straight to dessert and he had to brave the queue at snow ice stall. 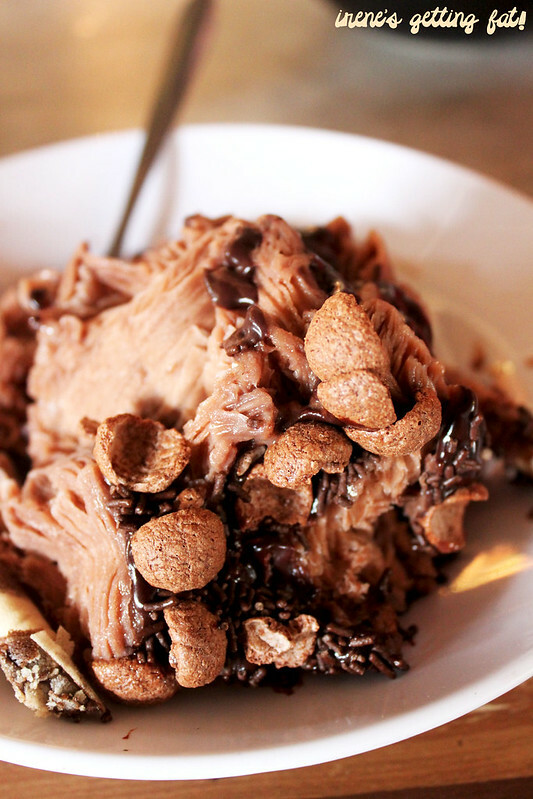 He was back with a slumped chocolate snow ice, and sweetly apologized because 'now it's not as pretty for the camera as it should be'. But I mean, who cares? It was still a beauty for me with the chocolate drizzle, wafer, and so on. It tasted a bit too sweet, but it was smooth and refreshing. 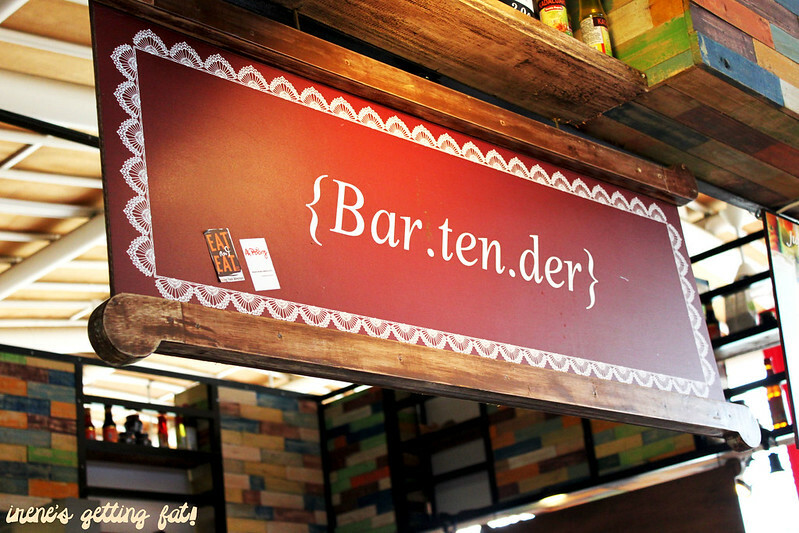 I had another 'dessert' in mind. 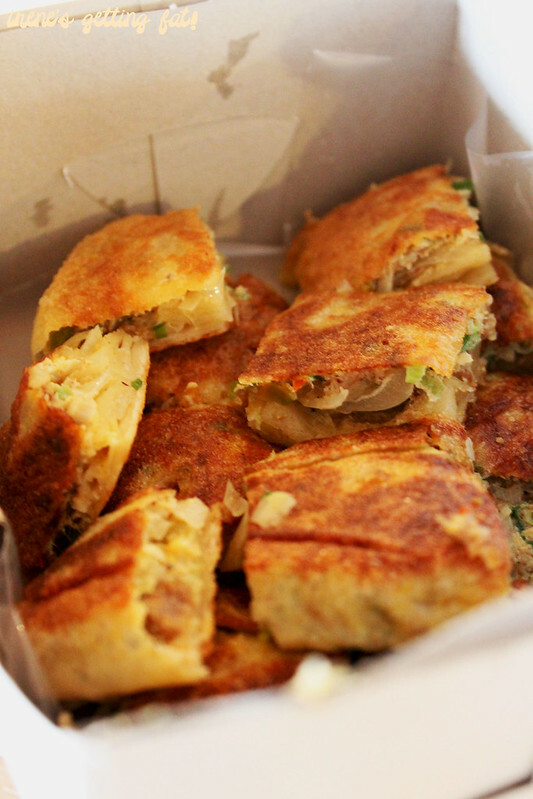 Maybe it was my curiosity or pure gluttony, I went to martabak Kupang stall to get the thick, savoury pancake. 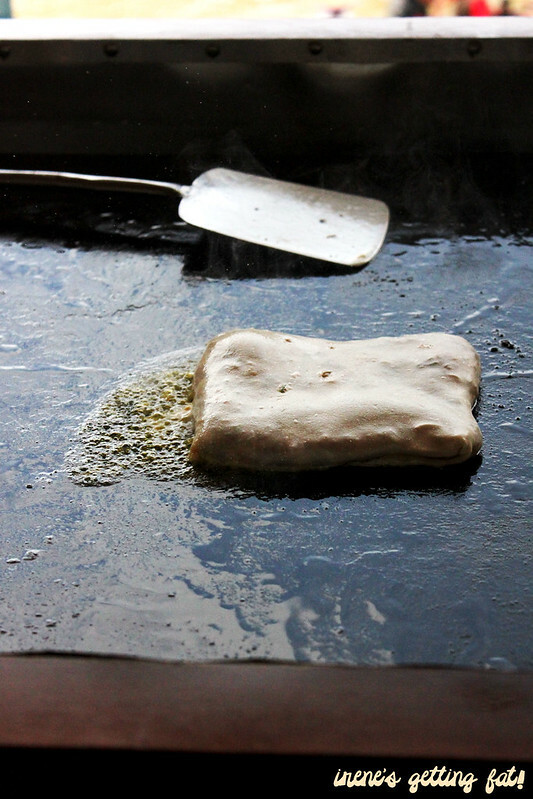 The making process was an entertainment on its own; the man was tossing, stretching, filling, folding, and finally frying the martabak into a tiny pool of butter. I had them in takeaway box because it started drizzling and I didn't want my food to be spoiled. My verdict, martabak Kupang was the best item among the three I tried that day. Crispy skin enveloping scrumptious filling of egg, meat, onion, scallion, and more, accompanied by sour dipping sauce and acar (pickled cucumber, carrot, and shallot). Boo-yeah. We didn't stay long at our table because there were people actually waiting for our table. Besides, the next table's occupant smoked, which is a negative point for non-smoker. So we wandered around the area, enjoying the cool breezes, and played around the park next to the eating area. Apart from the crazy rush-hour crowd, the smoker, and slightly overpriced food, I really enjoyed my time there. Given the opportunity in a weekday with a lovely weather, I would go get some bites again here. Rating is mostly given for the awesome ambiance, visiting early (not in rush hours) is highly recommended, price is relatively high for some items, great selections of food, service is OK.
El! Thanks loh udah di-blog-marathon-in hehehe. hope that u're enjoying my posts! emang El, parah bgt ngantrinya, apalagi rebutan mejanya ituloh..